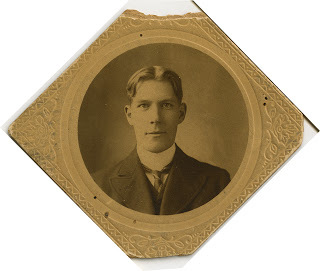 Lieutenant Lawrence Browning Rogers, aged 37, travelled to the front lines of World War One as a medic in the Fifth Canadian Mounted Rifles in 1915. He left behind his wife, May, his ten-year-old daughter, Aileen, and his seven-year-old son, Howard. The family exchanged hundreds of letters, many of which were kept by their descendents. This is one of them. I am out of the trenches again and not a bit sorry for it. I can assure you eight days is quite enough for one stretch. We expect to have eight days rest and then back in again. It is not so much the German shells or bullets that get my nerves, it is the awful sights I have to see and dress that is so hard. I don’t need any money as I am able to make what we get here last from pay day to pay day. We get about $6 a month. The rest is put to our credit and we can draw it when we go on leave or it will be there when the war is over. I hope to be able to get seven days leave in two or three weeks. I will go to London and visit Tom Richards’ mother and be able to see something of London. I received the scarf Mrs. Oglivy knitted for me. It is very nice and was awfully kind of her to send. I will write to her when I finish this letter to you. We have had some lovely weather but the nights are cold and today is decidedly cold but it is a good April weather. You know we all have to get old and I guess you will find a considerable change in me when I get back as this life tends to make us more serious than the ordinary life I used to live. I always knew Howard was a good little fellow and also Aileen. All they want is a little understanding and no one can say why they are not the perfect gentleman and lady. Poor Aileen, her troubles are beginning but with a little teaching from you she will be able to understand and help herself out of trouble. Today I saw some of those yellow flowers called marshmallows growing by a ditch. They looked fine and dandy. Guess I have about run out of material so will have to end. Love to you all and don’t worry about me. Everything will come out ok in the end. The Rogers family’s story is preserved in the picture book A Bear in War. For more information, including more letters, visit www.abearinwar.com. I am so glad the children received the cards and liked them. It is so hard to find things to send them. I have sent you a photo registered and another little parcel also registered. Hope we will have better luck this time. The holiday was not bad but it was not the nice bed that appealed to me, it was the nice, clean tablecloth and decent dishes and above all the difference in the people. You don’t know how much I miss seeing and talking to a real decent lady like Tom’s mother and aunt. That was far ahead of any soft bed. I am so used to sleeping on the hard wood that I don’t want a bed. You say usually we were happy. If there was ever a minute when I have made you unhappy I don’t know how to express my sorrow for I know there were times when things were not going just as they ought to…I will try and make amends when I get home again. I wish you would not work so hard as I want to find my girlie when I get back not a shadow or a skeleton but at least looking like a living being. Glad you do go out and have company. It is the best thing for you. You know I came over here to do my bit and it does not matter much to me how I do it, so long as I get the chance. Some of the fellows I am afraid have gotten cold feet and they are trying to back out as gracefully as possible. Some of them admit that if they had not thought that the war would be over by now they would not have enlisted. We have still a lot to be thankful for. I am still alive and well and as you have not said anything about anybody being sick I trust you are all the same as I am. Will have to close now as we are terribly busy. Love to you all and do take a rest. Daddy misses that great old chatterbox more than he can tell and when I get home you can talk all you want and I guess I won’t feel like telling you to stop. Aileen told me you had some furry little ducks. 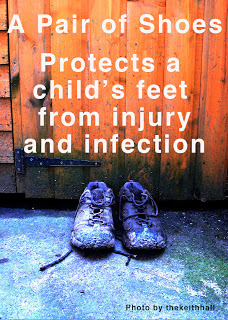 Take care of them. Just now as I am writing this letter to you a flying machine is going over our camp. It is so close that we can almost see the man in it and it makes a noise just like a great big bee and goes very fast. Be a good boy and take Daddy’s place with mother and see that nothing happens to her. Just keep her safe for Daddy when he comes home. I am sending a Three Penny to you. It is the kind of money we use over here and it is worth six cents in our money. 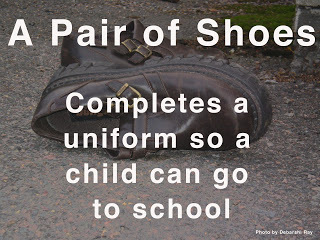 In the picture book A Good Trade, a little boy named Kato receives a life-changing pair of shoes. But why are they so life-changing? Here are a few reasons. A Good Trade is written by Alma Fullerton and illustrated by Karen Patkau. 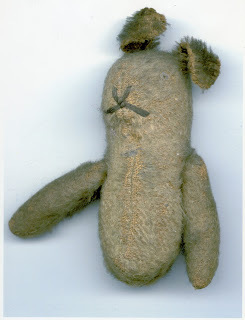 One of the most popular exhibits in the Canadian War Museum is a small, legless bear known simply as “Teddy.” During World War I, a little girl named Aileen Rogers sent the beloved bear to her father, Lieutenant Lawrence Browning Rogers, in a care package. Lieutenant Rogers died serving as a medic at the battle of Passchendaele, but Teddy was found in his pocket and returned to Aileen. 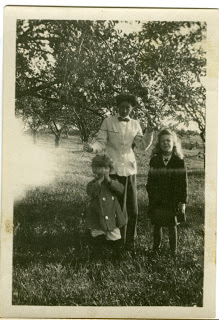 Decades later Aileen’s niece Roberta found the teddy and a wealth of wartime letters in a briefcase. Roberta’s daughter Stephanie Innes set out to write the picture book A Bear in War about Teddy’s experience, and Teddy himself found his way to the Canadian War Museum. In the early 1900s, the United States was not a strong competitor in doll manufacturing. However, with toy production all but ceasing in Europe during World War I, the door was opened for American expansion into the industry. Johnny Gruelle, whose young daughter Marcella died tragically in 1915, secured a trademark for her doll “Raggedy Ann” and wrote a collection of stories about the doll, said to be tales he had once spun for the ailing Marcella. In 1918 the stories and the first hand-sewn dolls hit the Christmas market and a phenomenon was born. 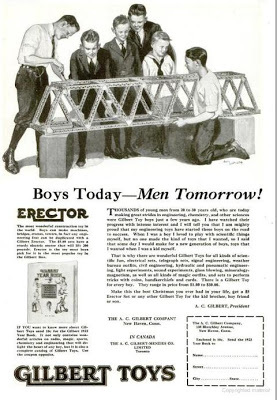 The 1910s were a time of change and discovery in engineering and industry, with World War I driving a constant stream of new developments. Complex building toys like the wooden Tinkertoys and metal Meccano and Erector Sets let kids get in on the excitement, inspiring the next generation of inventors and engineers. In 1943 naval mechanical engineer Richard James was experimenting with springs, trying to develop one that could help stabilize a ship’s instruments. When he accidentally knocked one of his models off a shelf and watched it walk down a stack of objects to the floor, history was made. 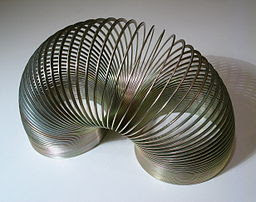 He and his wife Betty, who found the word “slinky” in the dictionary and thought it most appropriate, went into business. They sold their first 400 units within 90 minutes at a department store demonstration. When metal and rubber became scarce, and every scrap of either was needed for the war effort, toys made of paper and cardboard experienced a renaissance. 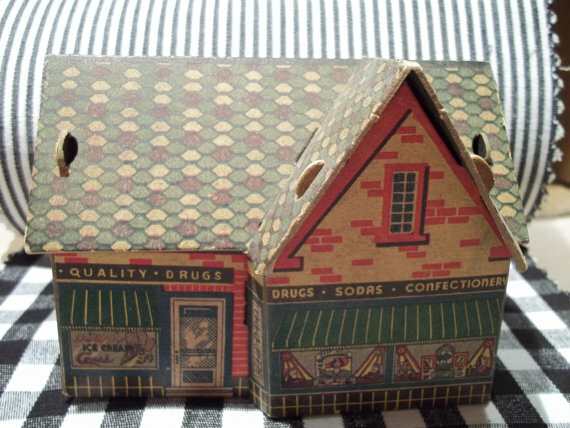 One popular toy of the 1940s, especially around Christmas time, was the printed cardboard house. Entire villages were available, and stores often created elaborate displays with toy trains running through them. In the United States many of these sets were emphatically stamped with “Made in U.S.A.” to differentiate them from the Japanese models that had been available before the war and were now widely shunned. 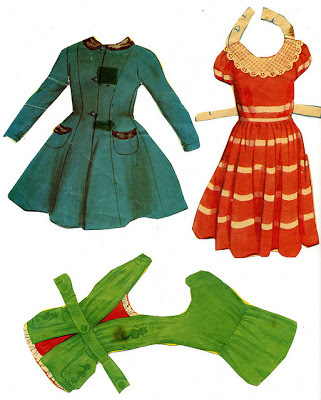 Paper dolls were popular for the same reason as cardboard houses: they were made out of a material that was not being rationed and was not needed for the war effort. One Canadian company produced paper nurses, soldiers in a variety of uniforms, and model battleships that could be folded into shape. During World War II Japan took control of many rubber-producing countries, leaving a rubber shortage in Western nations. American researchers attempted to develop a substitute and came up with a happy accident instead. 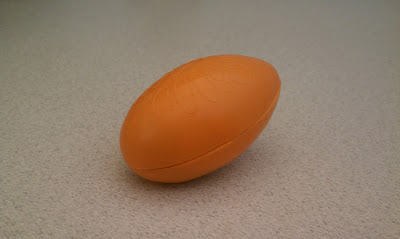 Silly putty may not have contributed much to the war effort, but it was certainly a hit on the homefront, selling wildly in toy stores. And although scientists around the world failed to find a use for it in the 1940s, it did find a practical purpose later in life: Apollo astronauts used it as an adhesive to secure objects in zero-gravity. Of course we could also talk about the ubiquitous lead soldiers and tin vehicles and cap guns, all of which flourished in a society where every child had war on his or her mind. 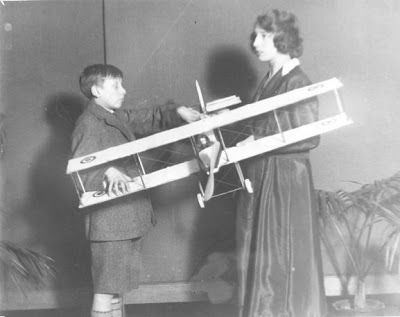 We could also talk about the homemade toys that became more common as toy manufacturers became more scarce, especially in Europe. What about you? 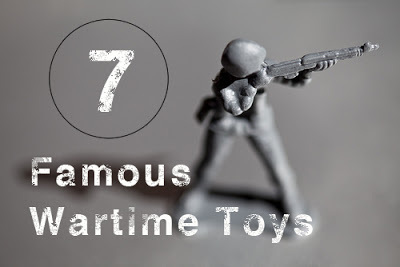 What wartime toys do you have stashed in an attic or displayed on a shelf? Let us know in the comments below. Pajama Press is proud to announce that three of our titles have been nominated for 2013 Ontario Library Association Forest of Reading Awards. Don’t Laugh at Giraffe by Rebecca Bender is nominated for the Blue Spruce Award. Last year, Rebecca won the Blue Spruce Award for her debut picture book, Giraffe and Bird. No Shelter Here: Making the World a Kinder Place for Dogs by animal activist Rob Laidlaw is nominated for the Silver Birch Nonfiction Award. Last Airlift: A Vietnamese Orphan’s Rescue from War by Marsha Forchuk Skrypuch is nominated for the Red Maple Nonfiction Award. For more information about the Forest of Reading Awards, visit the Ontario Library Association website at www.accessola.com. True Blue, a murder mystery by bestselling author Deborah Ellis, was nominated for the Manitoba Young Readers’ Choice Award and the Canadian Children’s Book Centre John Spray Mystery Award. Last Airlift: A Vietnamese Orphan’s Rescue from War by Marsha Forchuk Skrypuch was nominated for the British Columbia Red Cedar Nonfiction Award. Congratulations to all of our nominated authors! 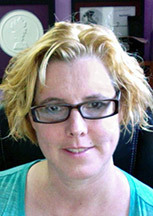 Alma Fullerton is the award-winning author of Burn, Libertad, Walking on Glass, and In the Garage. 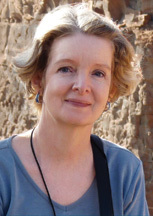 On October 15, 2012 she will be marking the publication of her first picture book, A Good Trade. Illustrated by Karen Patkau, A Good Trade tells the story of Kato, a young boy growing up in a Ugandan village. 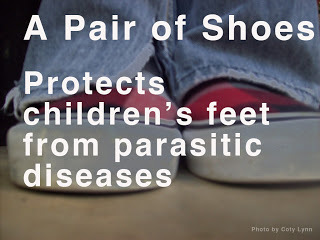 His daily routine includes chores and a dawn walk to the borehole for water, but one day the routine is disrupted: an aid worker brings a life-changing gift of shoes for all the village children, and Kato feels compelled to give her something precious is return. You are known for your free verse novels. Did you always want to write picture books as well, or was A Good Trade a new development for you? I wrote picture books before novels but it took me a long time to get it right. I’m at awe by some of my friends who do it well—all the time. How did you find the process of writing a picture book compared to writing a novel? Did anything surprise you? With novel writing you have to paint a picture with words, but with picture books you have to leave room for the illustrator to do it in pictures. It wasn’t until I got into visual art myself that I was able to ‘see’ where I needed to leave things to the illustrator. What surprised me was the fact that I had more editorial edits on A Good Trade, going through every word, than I did with all my novels. After the process I swore I’d never write another picture book. Of course, that statement didn’t last long. What inspired you to write Kato’s story? The inspiration came from a picture of an African child I found on the Internet while looking for art references. So many of my stories come from pictures, or true stories I hear about. One of the remarkable things about A Good Trade is that, using very few words, it manages to acknowledge the hardships of civil war and poverty in Uganda without lessening the joy and spirit of the story. Did you find this challenging? How did you approach it? What was your favourite part of working on this book? Finishing it? Honestly, I loved seeing Karen Patkau bring Kato to life with her fabulous illustrations. She was able to add the things the text didn’t say perfectly. 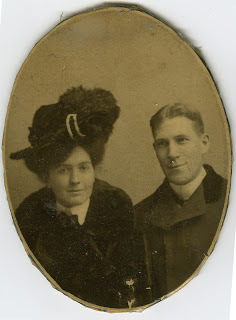 For more information about Alma Fullerton, visit her website at www.almafullerton.com. Karen Patkau is an award-winning artist and illustrator of children’s books. Written by Alma Fullerton, A Good Trade is a deceptively simple story about a special day in the life of a little boy growing up in Uganda. Karen joins us today to answer some questions about her work on the book. The text of A Good Trade is very brief, even minimalist. Do you find that an advantage as an illustrator, because it gives you a lot of room for interpretation, or is it easier when more of the story is fleshed out in the text? I loved the brief, but powerful text of A Good Trade. Rather than giving me a lot of room for interpretation, it clearly defined what content had to be included in each illustration to tell the story. I was allowed more freedom when visually embellishing the story. What was your favourite part about illustrating Kato’s story? I tried to echo the message of this story with simple and bold illustrations. I developed a digital collage technique for the text that I really like. I used to do traditional collage and still like the strong use of colour, shape, texture, and pattern. Illustrating Kato’s story, in this way, was a very fulfilling experience. My biggest challenge was keeping the children, especially Kato, slightly abstract yet recognizable throughout the illustrations. A Good Trade is a story of hope and gratitude, but it doesn’t ignore the realities of civil war and hardship in Uganda. How did you approach this balance in your art? I approached the contrasts in this story in a straightforward way. I needed to show the magnificence of the African landscape, as well as the hardships of poverty and horrible reminders of war. I needed to show the exuberance of the Ugandan children and Kato’s beautiful spirit—his hope, joy, resourcefulness, and gratitude; despite their daily struggles. Digital art is still a fairly new medium, especially in literary picture books. How do you find people respond to this style of art? Do you think it will one day be as mainstream as, say, watercolour illustrations? I think the quality of picture book art is determined by the creativity and skill of the illustrator rather than the medium. During picture book presentations that I give, both young and old are very curious about my digital technique and process. Digital imaging is now an established method for anyone studying illustration. So yes, I do think it will become as mainstream as traditional mediums such as watercolour. You can learn more about Karen at www.patkauillustration.com.